Our range of Brise Soleil offers architects new alternatives for light and durable façades with thin, streamlined shapes. Structural improvements to balance the amount of heat in a building by the diffusion of sunlight are strongly developed by using these types of profiles. The Bruntek range of up to 6000 mm supports multiple applications of Soleil Brisa in residential and industrial buildings. They can be used for public buildings, apartments or offices. 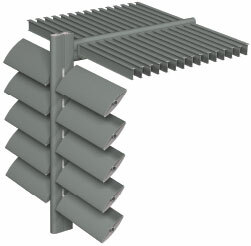 Why to choose Brise Soleil?